Are you always in a hurry? Do you always end up skipping breakfast? Not anymore! This wholesome milk shake is quick, easy to make, and meets 1/3 of your daily nutritional requirements. • Chop almonds and dates and set aside. • Dry roast the oats until it gives off a nice nutty aroma. Keep aside to cool. 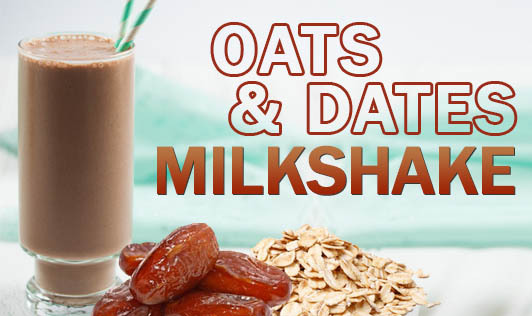 • Add the roasted nuts, almonds, dates, and milk into a blender and blend until you get a creamy consistency. • Refrigerate the shake for 30 minutes and serve chilled. • You may also garnish with dates and almonds before serving. • This recipe does not require any sugar as the dates are sweet enough to lend sweetness to the shake. • You can make the shake the day before and refrigerate it for the next day. • Diabetics can skip the dates and use cinnamon powder instead.